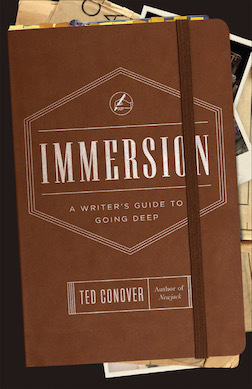 My new book, Immersion: A Writer’s Guide to Going Deep, is just out. It’s about the kind of writing I’m best known for, where the writer learns by placing himself in the world of his subjects for a time. I talk about gaining access, handling yourself once “inside,” turning experience into story, the special case of undercover reporting, and the ethical issues that surround this kind of longform nonfiction. Immersion (order yours now!) is full of stories from my own books and articles and from great writers I admire. I’ll share some of these tales at book events at the Tattered Cover in Denver, Book Culture on the Upper West Side, the Meg Cohen Design Shop in Soho, and other spots in the coming weeks, on my events page. For the latest news, follow me on Facebook or Twitter.